Four young people depart in a train. They try to guess their destination. Geo chats with his Aunt on Skype. The discussion draws a parallel between nowadays civilization and the Atlantis myth. What are the similarities? Is our end near? The others reflect on the mentioned topics: war, love, individual and global changes. Strange things start to happen, they have weird feelings and hallucinations. gathering to decide if humanity is repeating Atlantis' mistakes and to make decision. Gradually the Aunt reveals herself: she is an Angel, the messenger of the Gods. "Humanity is worth it, it deserves more patience." The Final Choral is interrupted by the youngsters' attempts. They each try to convince with singing - a solo vocal cadenza, the text of which is written by the singers of the respective roles. - Everything floated out of him, how come it is still all closed in his lap? 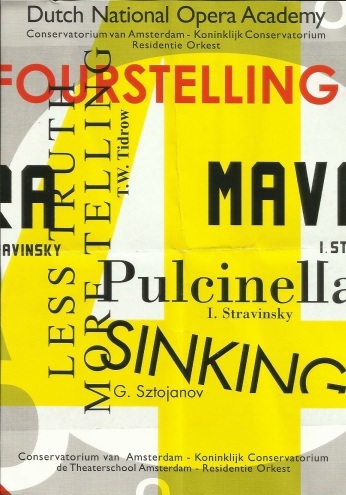 In 2013 january the DNOA premiered Sztojanov's first opera, SINKING. 5 chosen people, closely related to the composer (including himself) were the creators of their own characters. They "lived through" the surrealistic situations and tried to react as they would according to their personal character. The story was prepared by the composer, who - like in an RPG (role play game) described the group their environment, the happenings around them and even indicated some emotions and thoughts in them, while they as characters could be free to react how they feel like it, and as they couldnt know the end of the story, in a way could be as surprised as the audience would be. After more months of the virtual contact through emails the 4 youngsters met in Den Haag and finished the raw material for the libretto on skype sitting around a table and adding another layer of "documentalism". Choosing the parts of these conversations and shaping them into a libretto was the next step. astonishing visuals by the scenographer students of the AHK, and really memorable two last performances in Amsterdam with the musical leading of MaNoj Kamps.